Right: Liebig chromolithography trade cards featuring children as playing cards. German language on the reverse, published by Liebig's Company, London, 1891. Liebig issued almost 2,000 different sets of trade cards throughout Europe between 1872 and 1974. The history of the firm starts in 1847 when Justus von Liebig discovered how to make a concentrated essence from fresh meat. The business expanded rapidly and in 1865 the Liebig's Extract of Meat Company Limited was set up in London. 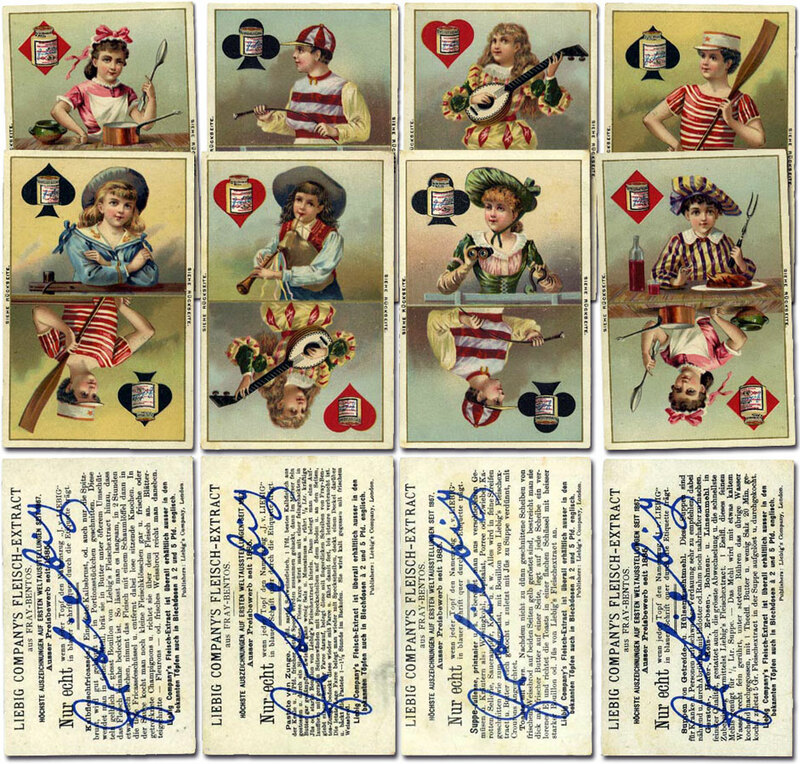 The first cards, or chromos, were published in 1872 and during the next 100 years almost 2,000 series were issued as a form of advertisement, but also educational as they cover almost every field of knowledge. Cards were distributed in many countries and in a number of languages. Most sets comprised 6 cards. Printed on coated card by the hand lithographic method using up to 12 colours they are fine examaples of the printer's art. 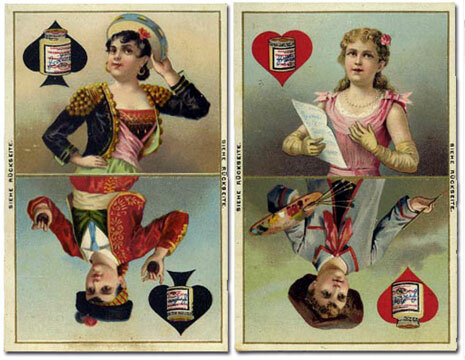 Above: Liebig trade cards featuring children as playing cards, with pots of beef extract on the suit symbols, 1891. German language text on the reverse, published by Liebig's Company, London.